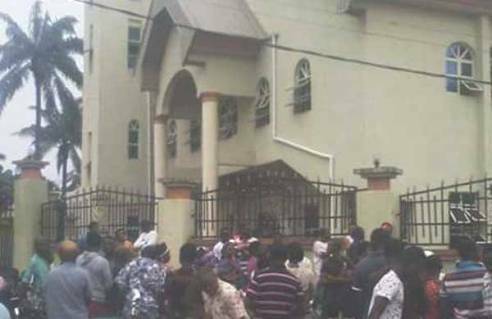 LAGOS APRIL 16TH (NEWSRANGERS)-A High court sitting in Awka has discharged and acquitted two remaining suspects standing trial for alleged involvement in the killing of worshipers in a church in Ozubulu, Anambra state. In a ruling that lasted for over three hours, Justice Fidelis Aniukwu ruled that the prosecution counsel was unable to prove beyond reasonable doubt the allegations leveled against the defendants, Chinedu Akpunonu and Onyebuchi Mbanefo. Unknown gunmen had on August 6, 2017, invaded St Philips Catholic Church, Ozubulu in Ekwusigo local government area of the state and killed no fewer than thirteen persons. The Judge had in December 2018 discharged two out of the four persons arraigned before a high court in November 2017 following the church attack. Justice Aniukwu argued that the prosecution witnesses could not provide any evidence linking the defendants with the murder as alleged. Reacting to the judgement, the defence counsel, Mr. Festus Kayemo SAN, described it as landmark in view of the accelerated hearing granted by the presiding Judge. Kayemo, represented in court by another counsel, Mr Samuel Echeakputa, however said he would not be surprised if the judgement would be appealed. “It’s the prosecution’s right to appeal the judgement. But from what I witnessed in the court today, it will be very difficult for the appeal court to upturn the judgement,” he said. One of the defendants, Mr Chinedu Akpunonu, was full of gratitude to God for vindicating him from what he described as attempt by some persons to smear his reputation. He however said he had forgiven his accusers, urging them to join hands to ensure peace reined in the community. He said, “From the beginning, I told my people that I was not involved in the killing. But the Lord gave me victory as a proof that I’m very innocent. “I didn’t know I was very important to my people until I saw excitement in the faces of crowd that came to court. I’ve already forgiven all that put hands to put me in prison. Meanwhile, the prosecution counsel, Mr Jay Jay Ezeuko SAN, said he would determine the next step after receiving a copy of the judgement.